The Reference Frame: Quadriga: are the director's cryptocoins really gone? Quadriga: are the director's cryptocoins really gone? A sad and unusual story recently took place in the Canadian world of cryptocurrencies. The young and only director of the top Canadian cryptoexchange, QuadrigaCX, Mr Gerald Cotten, has been a Crohn's disease sufferer (incidentally, there are preliminary hints of correlations with the Candida overgrowth but I am not eager about hearing the Crohn diagnosis – it's better to behave as if one is just mostly healthy). He went to India, a rather dangerous place for medical emergencies, and due to some Crohn's disease complications, he died on December 9th. Now, more than a month later, it turns out that the exchange still doesn't have any access to the funds in the "cold wallets" – which are worth USD $190 million, almost one-half of which is composed of 26,000+ Bitcoin. The company officially filed for (the Canadian) Chapter 11. The company is apparently over and there is no one who could pay the $190 million to the users. You know, cryptocurrency exchanges aren't FDIC insured or anything of the sort. The widow and the board insist that the late husband was the only person who knew how to produce the private keys needed to send the cryptocoins. First, it's a sad story – a young man and probably an idealist chap died. Second, the loss shows the amazing Wild West character of the cryptocurrency Universe. If you have money in Bank of America, you expect to have the money even if the CEO unexpectedly passes away. Not only you expect not to lose 100%. You expect not to lose a tiny fraction. You even expect all your business to continue unaffected. It's different in the world of Bitcoin. The users probably lost everything and they can do nothing about it. The Bitcoin operates outside any legal framework – well, its champions are often explicitly claiming that the Bitcoin algorithms are meant to replace the conventional law. In fact, according to some legal analyses, the ownership of the Bitcoin doesn't even legally exist – so if you rob someone (by getting his private key), it's just legal. You can't be protected by the courts if you're robbed. Some true Bitcoin missionaries (including Alena Satoshi Vránová, a Czechoslovak female CEO who produces the Trezor wallet you can buy from the Amazon link) say that all Bitcoin holders should have their private keys – they should never trust any custodian. But this rule is just a ludicrous fantasy because without the infrastructure such as the cryptoexchanges, the Bitcoin would be almost totally unusable – it would be even less usable than it is now, and by a long shot. The trading would be extremely cumbersome and the prices wouldn't be well-defined – or would be inaccurate. In the modern world, most people just can't live without "something like banks" (and "custodians" in the banking sense) and "something like currency exchanges". Everyone who claims otherwise is detached from reality. Now, the total value of the world's cryptocurrencies is now $115 billion or so. The disappeared amount of $190 million is almost 0.2%. It is not really a negligible fraction of the total money. And similar events are happening rather frequently (Mt Gox, NiceHash which only reimbursed some 70% as of now, and tons of others), perhaps a few times a year. A few times a year, if you're the 1 unlucky person among 500, you lose all your funds. The probability is of order "dozens of percent" that before you die, you will be stripped of your cryptocurrency holdings. Nice. Well, that's on top of the 82% drop of the Bitcoin price from the all time high. Because of the Wild West nature of this shadow economy, we can ask further, totally sensible but disturbing, questions. Did he die at all? Maybe he just faked his death, got a new identity, and will enjoy those $190 million with this new identity. Even if he did die and you could see some evidence involving the DNA tests or whatever could really persuade us, another question is: Were the private keys really lost? Cotten probably spent some time on the death bed. Didn't he contact his wife, members of the board, or someone else – to convey the method to acquire all the private keys? It would make sense for him to try, wouldn't it? His wife or someone else whom he cared about could steal those users' funds. Alternatively, an Indian doctor or someone who got to the hospital could know who the patient was. He could have tortured Mr Cotten, blackmail him, or do something else and simply acquire the control over the private keys from Mr Cotten – while being almost certain that Cotten would never speak again. So a surprising sub-billionaire could suddenly emerge in India. Even if it took place and people were suspicious, they could probably do nothing about it. Even if there were evidence of the theft, the courts could be unable to do anything about the crime. This describes the situation in an alternative monetary and financial system that I consider vastly inferior relatively to what we have. Much of the modern capitalist society depends on the proper defense of the private ownership (money, stocks, funds, derivatives, real estate, movable assets, and even intellectual property). There exist some structures – key parts of the "governments" and "states" – that are responsible for protecting the private ownership, so that the people don't spend most of their lives by defending their assets against thieves, and so that the thieves with enough brute force don't end up being the only "elite" (because we appreciate that lots of people without the brute force are more important for the progress and well-being of the mankind). The police and courts must operate so that the intuitive, human understanding of the ownership or theft are translated into justice. The intuitive, human understanding of the ownership or theft is being enhanced by various tools – e.g. detailed laws, the land registry, and other things that help us to decide who is the actual owner. But the land registry is just a tool and the employees are servants who do some hard but not "dictatorial" work in the determination of the owners. The human intuition about the ownership is at the top! Bitcoin really wants to place the algorithms at the top. 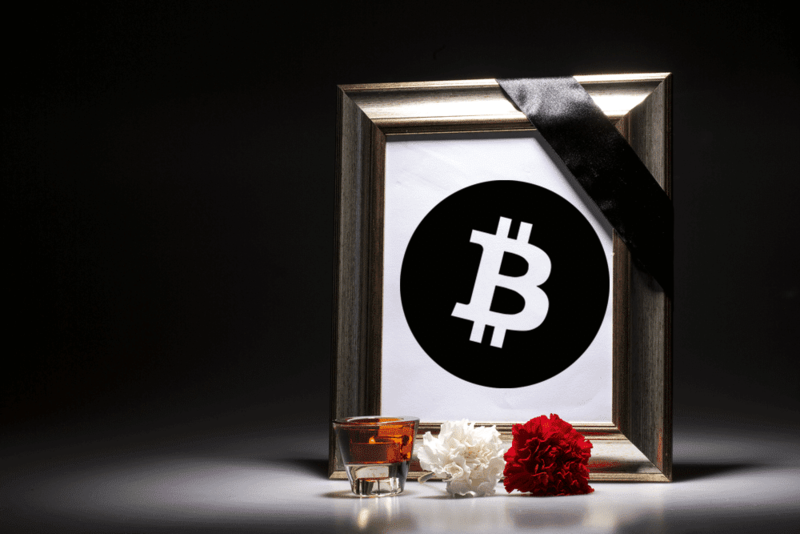 The custodians dies and the private keys are lost – or acquired by an unknown person – and the Bitcoin philosophy basically tells us: "It's alright, this is exactly the perfect world and this is how it should work according to our system because the owner is the man who has the keys. The Quadriga's users were unlucky or dumb." The Bitcoin fans may say such things but rational people should still compare the hospitality of that system with the system we have – and if they do so correctly, I am sure that they will conclude that our existing system is vastly superior. Needless to say, my conclusion is nothing else than an example of some "conservative thinking". In many cases, I end up – and most of you end up – thinking that the system as it has evolved over the centuries is better than the proposed revolutionary alternatives. But there exists a strengthening collection of revolutionary movements that want to brutally impose the view that "the new system is always better" on the world. They exploit blackmail, hype, propaganda, buzzwords such as "disruption" – but at the end, the point is to liquidate some essential features of our society and replace them with pathological or dysfunctional "alternatives".